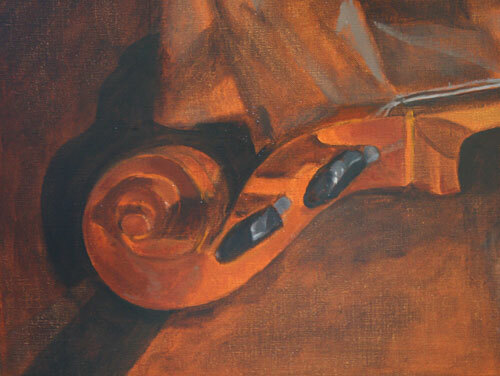 I am moving into the color portion of the painting and since I felt I needed to get a handle on painting the cello scroll, I started there. I would normally start with the bigger and darker shapes but decided to approach this painting a bit differently. It is going agonizingly slow. Even though I drew the scroll and painted it in the grisaille, I still had to do a lot of adjustments. There is still more to be done as well but I will be leaving it here for this first pass with color. 1.Cello scrolls are freakin hard to paint and make my eyes cross. 2. Fear likes to sneak up behind you and put you in a choke hold. 3.Being an Aries/Taurus mix means that I will stubbornly hang in there until the fire within can toss Fear off. 4. Cello scrolls have a subtle intricate beauty that can take your breath away. 5. Cad. Orange is my friend. Ah, the fear part. I was struggling trying to get it to look right when I stepped back a moment to evaluate why I was struggling. I realized I was nudging it around and getting nowhere because I was afraid I would lose what I already had and would never get it back! I realized that I really needed to wipe out part and rebuild the shapes. I took a deep breath and did just that and things went a lot smoother. I tell you, fear can really trip you up if you aren't careful! The vigilance never ends either. 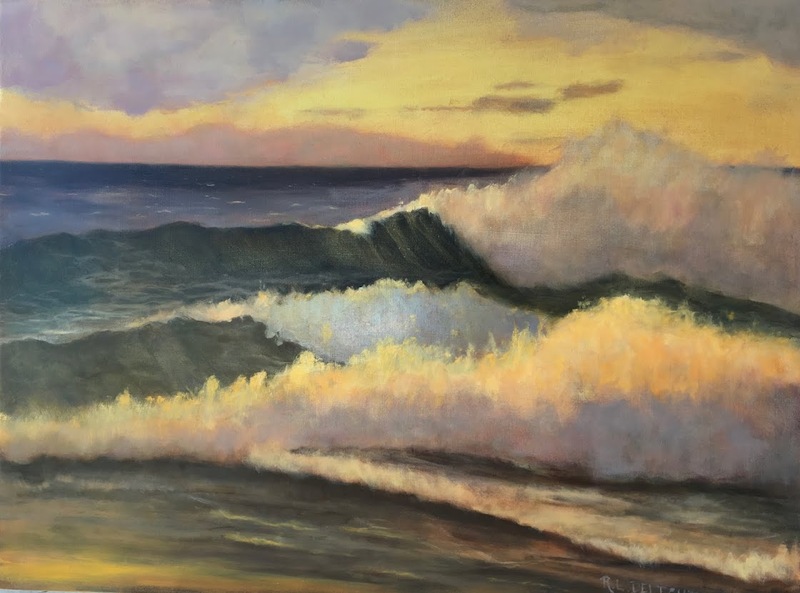 I will get a bit more time in on the painting this week and then I will need to get another painting started next week so progress will slow down even more. It should be an interesting week. Hard to believe it is already the middle of July. Hope all of you out there are staying cool. Looks good! I love your comments about fear and your analysis of how it was restricting you. Why is fear so powerful? I love watching your painting processes. Onward! Hi Dana! Thanks for the comment. I am woefully behind on reading my e-mail and my favorite blogs. Summer activities plus time in the studio take a huge wonderful juicy bite out of my time right now. I will be catching up with you soon!